TLC Carpet Care's WATER CLAW Sub-Surface urine Lifter also has the same performance technology and construction style of the larger Water Claw Flood Tool but in a easy to use hand-held design that has fast become an carpet cleaning standard for thoroughly removing contaminants deposited in carpet backing and pad. Watching closely and through the clear acrylic top as uriine in the carpet are flushed up out and away. Flush out urine contamination soft drinks oils soap residues food spills etc. completely. 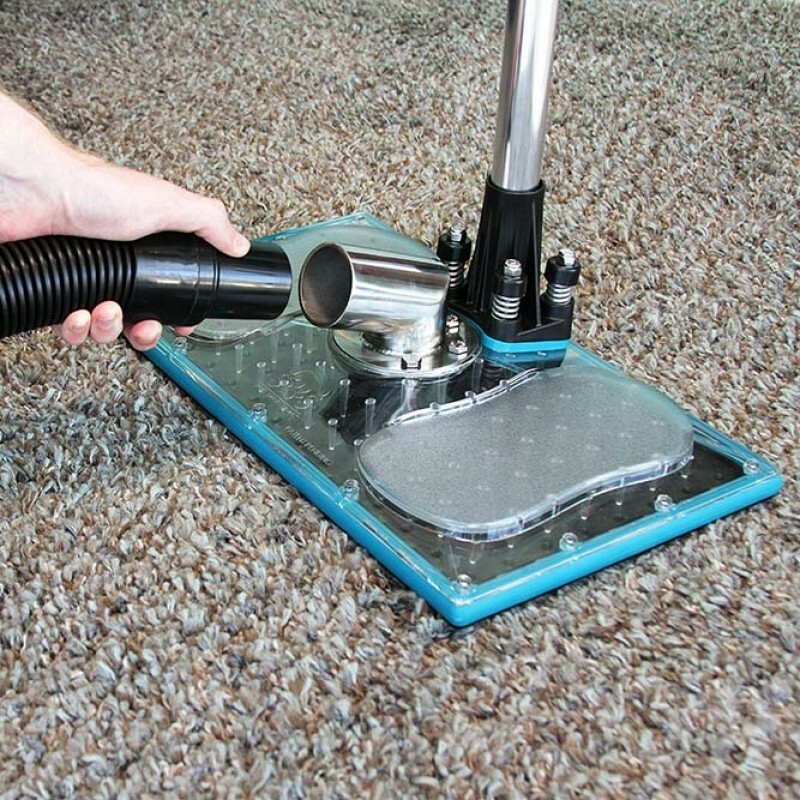 TLC Carpet Care in Castle Rock Co uses Prochem truckmounts and portable or mini-extractor. Accepting both 1 1/2" and 2" hose cuffs. Every carpet cleaner must have for every cleaner!The WATER CLAW Sub-Surface Spot Lifter works on the same carpets as our flood tools but can perform Sub-Surface spot removal with any Truck mount carpet cleaning source including a truck mount portable or wet dry mini-extractor. Standard hose adapter accepts 2 and 1-1/2 hose cuffs.The mechanics of Sub-Surface spot removal is: any contaminants in carpet and/or pad that can be suspended in a liquid can be extracted out with the WATER CLAW. Whatever amount of urine is introduced to the carpet and padding after extended dwell time can be quickly drawn back out again with the TLC Carpet Care's WATER CLAW and typically dry out completely overnight .Be sure the area under the spot lifter is saturated through both carpets and padding. The tool can be used in any part of the home and can be picked up and repositioned or slowly dragged across the urine saturated area. The WATER CLAW Sub-Surface Spot Lifter literally flushes contaminants from carpet face fibers backing and pad. Great results can be achieved on a variety of urine problems when combined with TLC Carpet Care's professional carpet cleaning technicians knowledge of urine spotting solutions for example:• dog and cat urine: saturate with hot water then apply the CLAW.• Oils: saturate with a dilution of your favorite degreasing cleaner WATER CLAW. Then saturate with a rinsing agent to remove cleaner residue and WATER CLAW the area again.• Soap residue: saturate with a mixture of cold water not hot and defoamer then WATER CLAW it.• Pet urine: saturate with your favorite urine liquefier. make sure to make a small amount of dwell time followed by the Claw. (Repeat this step as needed.) Then saturate with your favorite urine deodorizer for your final flush and Clawing. (Some single carpet cleaning chemicals perform well for both purposes).• Wicking problems: wicking problems of all kinds can be flushed out with the proper spotting dilutions or even straight water as determined by TLC Carpet Care's technician. Be sure the area under the spot lifter is saturated through both carpet and pad.The tool can be picked up and repositioned or slowly dragged across the saturated area applying downward pressure while the extraction process is performed.The amount of water used for saturation will be determined by the carpet cleaning technician understanding that whatever amount of water is introduced to the carpet and pad can be drawn back out again with the WaterClaw.It is recommended that the technician first explain to the customer the procedure used for Sub-Surface spot removal to avoid alarming the clients during the saturation process. We also suggest that you invite the client to watch through the clear-top plate while the Sub-Surface extraction process is being performed. This will greatly impress clients of TLCCarpet Care's expertise and professionalism.1 ) WHOOPS!2) Mix your urine spotter with water and pour a generous amount into the carpet and pad. This will liquefy the dry urine.3) Apply the WaterClaw for Sub-Surface Extraction. Watch your extraction results through the clear top plate. (Repeat steps 1 and 2 as needed. )4) After heavy deposits are flushed out mix an odor counteractant or other solution with water and pour onto carpet and pad.5) Apply WaterClaw for Sub-Surface Extraction. The last step will leave a carpet cleaners chemical residue for odor control.6) Let dry. Job is done better and at a fraction of the time and cost of other processes.